On behalf of Ellen DeGeneres, Susan Jordan and Suzanne Perkins present Ellen’s Montecito Disaster Relief Fund Check to the Montecito Bucket Brigade Co-Founder, Abe Powell. 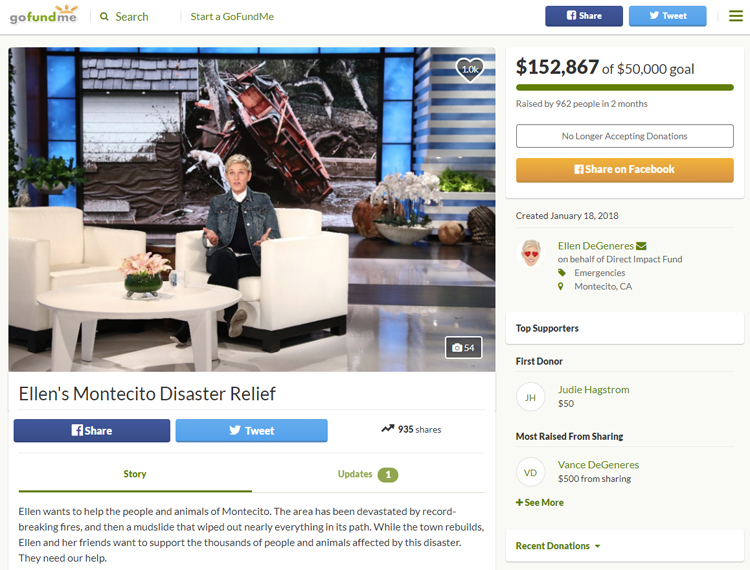 MONTECITO, CA (March 20, 2018) – The first check from Ellen’s DeGeneres’s GoFundMe Montecito Disaster Relief Fund for $20,000.00, was distributed to Abe Powell, the Co-Founder of the Montecito Bucket Brigade. Suzanne Perkins, of Sotheby’s International Realty, and Susan Jordan, Executive Director of the California Coastal Protection Network, have been instrumental in working with Ellen’s team to organize all the local charities that are helping in local relief efforts, and will ultimately receive funds from Ellen’s GoFundMe charity. For more information, please contact Suzanne Perkins at suzanne@suzanneperkins.com or Susan Jordan at sjordan@coastaladvocates.com.